When you’re looking for music lessons, finding the right teacher can seem like a huge undertaking or one of those “that was too easy” scenarios. Students often feel like they’re stuck with the first teacher they encounter, or that all the teachers at a given music school will be the same. There are so many different teaching styles, personalities and levels of expertise in the field of music, and those have to mesh with the student’s goals and interests. A brief interview and trial lesson is the best way to determine if a teacher is right for you, but what questions should you ask? To help clear the uncertainty, we’ve put together a list of 6 key considerations when you’re looking for the right music teacher. Your Goals. Before you start shopping for a teacher, you need to know what the student’s goals are. Are you an adult learner just starting lessons for the fun? Is your child hoping to be world-famous? For some people, they just want to learn to play a few songs. Others might be looking for music lessons that provide a well-rounded musical education. Knowing what your goals are is an important part of finding the right person to help you meet those goals. Teacher Experience. The first couple of years of music lessons are vital to setting up excellent foundations and habits. A seasoned teacher will be able to provide a beginner with those fundamentals gets the fundamentals, paving the path for success in music, regardless of the student’s goals. While every teacher has to get started somewhere, it doesn’t have to be with you. Musical Genre. A classically-trained piano teacher won’t be able to help realize your dream to perform; just as a drum teacher with a jazz background will fall short on teaching you rock and roll techniques. Remember that not all teachers come from the same training and background, and ask the right questions to get your music lessons off to the right start. Teaching Methodology. The teacher’s methods of training are very important. Some methods are going to be more effective for you than others. Primarily, this is an important question to ask a teacher to get a sense of whether or not they offer any structure. As a follow up, ask them their reasons for using their method and expect a clear answer. This can help you gauge their experience and knowledge as a music teacher. Music Theory. Hopefully, you’re engaged with a music teacher that wants to help develop music skills that will help you or your child read, write and interpret music more effectively. While it may seem like too much “work”, especially for a beginner, these fundamentals allow a student to progress further in their musical education and make it easier to transition to other instruments later, if desired. Their Passion. We can all spot burn out pretty easily. If you wind up taking music lessons with someone who has lost all zeal for music, you will be the one to suffer. Ask the teacher how they inspire their students and what they love about music. Not only should their answer be cohesive, but you should be able to see those telltale signs of interest as they talk. If their response is lifeless, consider a different teacher. Whether you’re looking to take lessons at a premier music school in Toronto or are looking for a private teacher, remember first that nothing beats in-person music lessons. it’s best to try a few trial lessons with different teachers to find the best match. If you don’t jive with a teacher or they don’t meet your criteria, don’t be shy about finding a different teacher, even at the same school. By taking the time to find the right teacher, you’ll provide yourself or your child with the best foundation possible, bringing you closer to your musical goals. 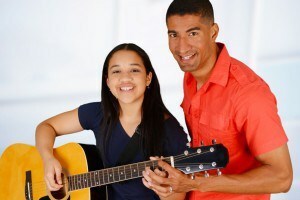 Elite Music Academy offers trial music lessons for all instruments in Toronto with all of our music teachers. Call us at 416-406-5355 to book your trial music lesson now!